What is the most important thing in an aquarium? The fish? The substrate? The foliage? The ornaments? The filters? The heater? Well, of course, it is none of these things. It is the water. This is by far and away the most important aspect, for without it everything else is rendered useless, or in the case of the fish, sadly dead. So with this in mind, I thought I would share with you some advice on this most important constituent. The stress-free and most obvious – and typically least expensive – is to use water from the kitchen tap. Tap water is obtainable to almost anyone keeping an aquarium and is nearly always going to be satisfactory for your fish. Nevertheless, you should be aware that if your tap water is from a public water supply, or if you have a holding tank on your premises then you doubtless have chlorinated water. If so you will need to use a de-chlorinator or a chloramine remover to make the water harmless for your aquarium, contingent on which compound is used in your water system. Water from another fish tank is another prospect. This can sometimes be useful when setting up a new aquarium. Nevertheless, it does have disadvantages. If you don’t know the tanks provenance and that of the water conditions, this can pose a danger of disease or chemical toxicity to your fish. This is particularly the case of water from aquariums in pet stores where the quick turnover of fish can introduce disease into the water with no chance of detection. The risks far outweigh the minimal benefits, so it is not recommended. The exception to this might be when moving an existing aquarium. Taking as much of the water from the old tank as possible dramatically helps the biological filter get restarted. RO or DI water bought from a pet shop is undoubtedly a choice. RO and DI are dual methods of purifying water. This removes the contaminations and any particulate that might be present or neutralises the pH by removing the various ions that might be free in the water. Although this provides you with very pure water, this water is possibly hazardous for your fish tank. With all the contamination removed from the water, its capacity for maintaining its chemical make-up is compromised. There is a danger the water could suffer an unexpected and dramatic variation in pH, alkalinity and hardness when any kind of chemical is introduced – even the ornaments! It is vital to know how to balance this water appropriately if you want to make sure it will stay stable. Moreover, RO or DI water will have most, if not all, of the trace elements that your fish and plants need to remain healthy removed, further posing a further risk. It is imperative to acquire the correct supplements for your fish or plants and learn how to add them and to test that you have the right concentrations. Although RO or DI water can be very beneficial to advanced aquarists, I wouldn’t endorse RO or DI water to a novice. Some individuals may want to use softened water from a water softener used in the home. Although this ought to be safe, it would be best to check with the maker of your softener or the softening media used to confirm whether the water is safe for aquariums before adding it. Bottled water is another water source you might consider. However, I would not recommend it unless you are completely satisfied your tap water is not actually safe. Bottled water is frequently not regulated or in fact, tested, so the actual parameters are unknown. Moreover, bottled water often has vitamins, flavours, preservatives, colours, or other additives to make the water more appealing but these can have a devastating effect on your fish tank. Believe it or not, some people are interested in using rainwater for their fish tank. If that’s you then you should consider the condition of the air and how that might leave the rain water. The water that emerges from your kitchen tap has been filtered through soil and then processed to make sure it’s drinkable. Rainwater, however, can carry pollutants from the air, as well as possible impurities from piping and other areas it has flowed through or over before arriving at your collection receptacle – in addition to the risks of contamination in the collection equipment itself. Rainwater will also lack the necessary trace elements needed to keep your fish fit, as well as those essential for water to maintain a proper chemical balance. Best avoided. You may want to just collect water from a local lake or stream. Although this may be tempting, it does pose some dangers. 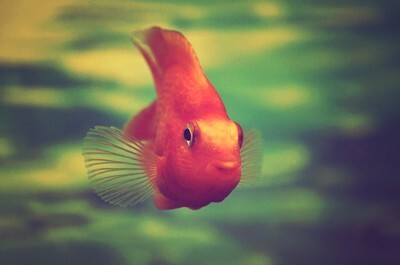 This water may harbour pollutants which may cause problems in the limited volume of a fish tank. This water is also likely to contain pathogens for diseases that your fish will be ill prepared for and which could result in a disease epidemic in your aquarium. Also, the water may harbour parasites which could wipe out all your fish. My advice for novice fish keepers is to use tap water unless you are certain of a good reason not to use it such as your water supply is known to be contaminated. For a novice, tap water will be the way to go. It should prove to be an excellent water source for a broad range of fish, is freely available, is inexpensive, and is easy to prepare for use in your aquarium. Tap water typically has known, and comparatively stable bounds and inclines towards being chemically stable, so sudden variations in pH or other parameters are improbable unless you start messing with them.